RENO, Nev. (AP) — A bear that apparently became too accustomed to the good life at a ski resort at Lake Tahoe is headed for an animal sanctuary or zoo after wildlife officials decided he's unfortunately become too domesticated to be returned to the wild. The year-old black bear, dubbed "Heavenly," was captured in March after it settled in next to a ski lift at the Heavenly Mountain Resort at Stateline on the California-Nevada line. Veterinarians at the Lake Tahoe Wildlife Care Center nursed him back to health. California wildlife officials released him last week in the Sierra near Monitor Pass, about 25 miles south of the lake. But they say he made it back to Tahoe within a matter of days and started approaching people again. "It's the exact same bear," Nevada Department of Wildlife spokesman Chris Healy said Tuesday about the bear that turned up again a few miles northeast of the ski resort near Glenbrook. "Our plan originally was to take him out in the mountains again over in the Wellington area (50 miles southeast of Tahoe), but it's just so acclimated to humans as a source of food and obviously has honed in on this area," he told The Associated Press. "It's a disaster for this magnificent animal," Healy said. "Wild animals should not be in cages their whole life. It's a real indictment of the way garbage is handled, or not handled." Heavenly is currently staying at the Lake Tahoe Wildlife Care Center in South Lake Tahoe, California, where he earlier was treated for a puncture wound to the shoulder and scraped up pads on the bottom of his feet. "Our primary goal is to keep them wild," said Jason Holley, supervising wildlife biologist for the California Department of Fish and Game. "But apparently, this one is just looking for handouts from people." 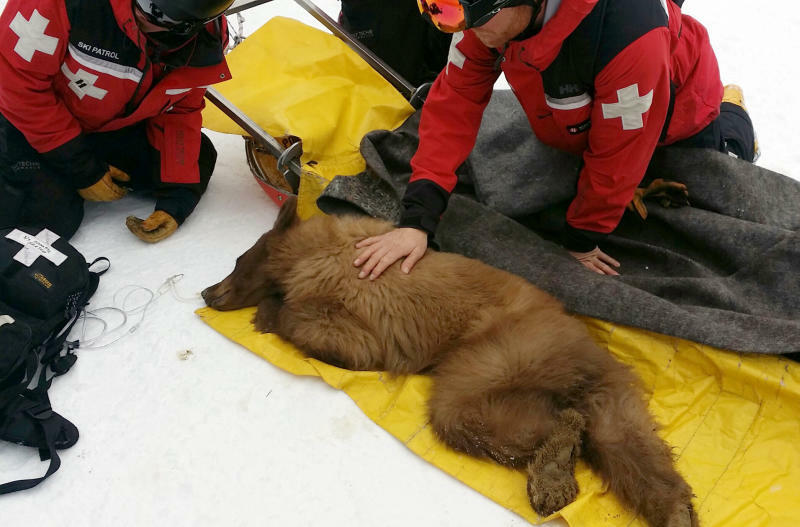 Heavenly spokeswoman Sally Gunter said Tuesday that the resort had to close off an area around one ski lift for a few hours March 3 after the injured bear was seen limping up the hill. He eventually lay down near the chair lift shack before the full resort opened for the day, she said. NDOW biologist Carl Lackey shot the bear with a tranquilizer dart, and the ski patrol helped transport it downhill. Tom Millham, secretary of the care center, said they had hoped for a happy ending in the wilderness but are resigned to the fact that's no longer an option. "We really only have two alternatives: One is to put him down, or the other would be to place him," he told KRNV-TV in Reno. "So yeah, placing him would be the lesser of two evils."